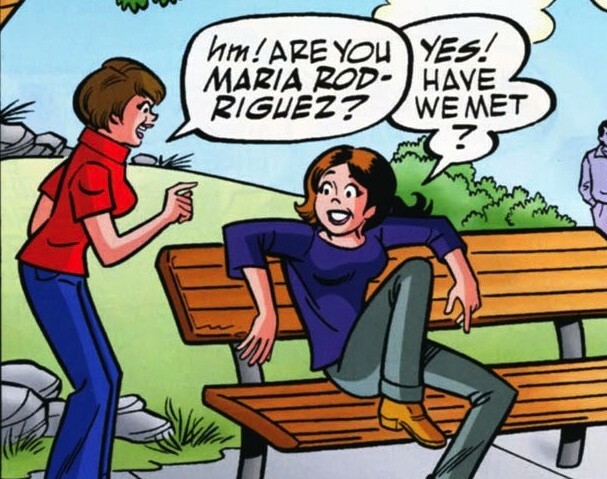 This week’s minorities in cartoons entry is Maria Rodriguez, a character appearing in Archie comics. From what I could find, Maria first appeared in “Archie’s Girls Betty & Veronica” #257 (May 1977). She was created by Frank Doyle and Dan DeCarlo. Maria was introduced in the 1970s Archie comics to add some diversity to Riverdale. As such, early stories would sometimes make mention of Maria’s ancestry, including being skilled in Spanish. One such story features Maria attempting to tutor Jughead to improve his Spanish grades. Jughead, meanwhile, was more concerned about being seen hanging around a girl. Said tutoring came at the urging of Maria’s father, who was at the time vice-principal of Riverdale High School. This point isn’t consistent, however. Some post-70s stories either don’t show a vice-principal at all, or use instead a drill sergeant-like strict character named Patton Howitzer. Similar to fellow 70s newcomer Nancy Woods, Maria has a steady boyfriend, singer Frankie Valdez. Frankie’s singing came up in a storyline where Frankie partners with another female character (Brigitte Reilly, a heavy-set singer occasionally seen in stories) to form a duet. While Maria was initially wary of this, her fears were soon dissipated. Maria is less frequently seen in modern stories, with newer character Ginger Lopez apparently having eclipsed her in popularity. However, when Maria does appear, she’s still friends with Betty and Veronica, plus other girls in Riverdale. This was seen in a 2010 storyline where Riverdale’s teenage girls all form teams of “BFF”s for a TV competition.